WASHINGTON, DC -- Voltaire reportedly said that those who can persuade one to believe absurdities will lead one to commit atrocities. In contemporary politics, Russia’s stance on Ukraine represents a cardinal example of the enduring validity of Voltaire’s remark. 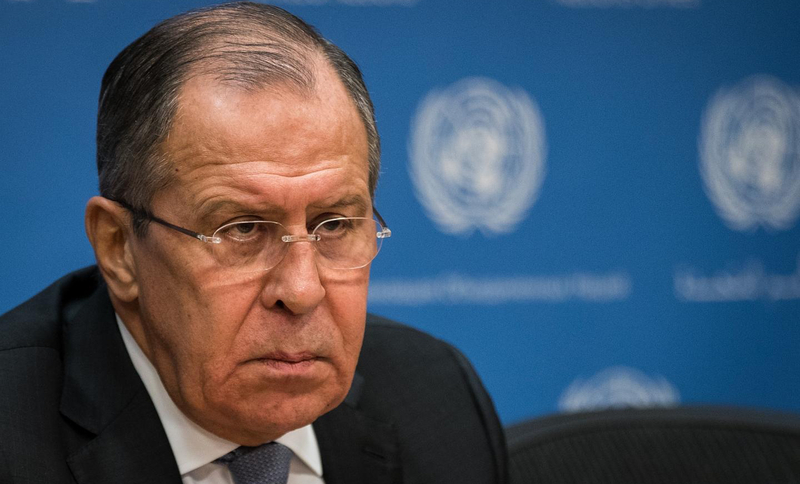 Russian Foreign Minister Sergey Lavrov at United Nations headquarters, January 19, 2018 in New York City. Russian Foreign Minister Sergei Lavrov recently restated three lies: there are no Russian troops in the Donbas, the conflict in eastern Ukraine is a civil war, not a Russian invasion, and the shooting down of Malaysia Airlines Flight 17 in July 2014 had nothing to do with Russian forces. All of these are bold-face lies. No amount of prevarication can obscure fact, although the Kremlin has tried mightily. Lavrov’s and his government’s continuing mendacity are so relentless that many have come to take for granted that Russia as a state is defined by its habitual lying. And along with it goes the never-ending refrain that Russia is always the victim of others’ nefarious activities, never the author of its own misfortunates. But my purpose is not simply to point out that the Russian government and media lies, but to show that this recourse to mendacity and self-absolution betrays the fact that despite negotiations with the US representative on Ukraine, Ambassador Kurt Volker, and the Normandy Four (Ukraine, France, and Germany), Moscow has no intention of getting out of the Donbass or returning Crimea. If anything, it is reinforcing its forces in Crimea by dispatching more S-400 surface to air missiles there and striving to invest even more resources needed at home in Crimea. It also consistently represses any persons or phenomena that evokes an independent Ukraine. Russia refuses to accept a negotiated outcome that entails its retreat from the Donbass or Crimea. Moscow now insists that Ukraine accede to the suicidal Minsk II agreement that would effectively convert Ukraine into a confederation whose sovereignty could be punctured at any point by the Donbass, much as the confederacy attempted to destroy the Union in the American Civil War 150 years ago. Yet it remains the case that the real problem with the Misnk II accords is that Russia has never even bothered to hide its refusal to comply with it in any form. Thus its demands are without merit and a dodge to avoid compliance. At the heart of this crisis is the fact that Russia still cannot accept Ukraine’s de jure independence as a sovereign and separate state. In Moscow, power rests on the notion of an imperial state to whom all other members of the former Warsaw Pact must surrender part of their sovereignty. The claque of Western writers arguing that Russia is somehow entitled to its desired sphere of influence or that Western advances into Central and Eastern Europe are the root cause of this crisis overlook two critical facts. First, since 1991 Russia has never had the capability to dominate Eurasia by peaceful or democratic means. Even now in Central Asia local governments are progressively asserting more independence while China is steadily supplanting Russia there. In Belarus President Lukashenko visibly chafes at Russian efforts to usurp the state’s power. And in Ukraine since at least 2004 it is clear that the population will not accept the diminution of Ukraine’s independence despite its government’s corruption. Thus a sphere of influence can only be retained by force, fraud, and subversion, and is unsustainable given the real power and capability that Russia possesses. Second, there was no unilateral Western advance into some land that Russia believes somehow or by its history belongs to a Russian sphere. Instead every government has welcomed the West, either as NATO or as the EU, and exercised its own sovereignty in doing so. If this be empire, it is an empire by invitation to use the Norwegian scholar Geir Lundestad’s term. So it is not surprising that a regime, acutely aware of the possibility that without empire its autocracy is at risk, resorted to violence when challenged by an expression of popular democracy in Ukraine. Nor should we surprised about the intersection between the official mendacity of Putin’s state and its propensity to violence. As Solzhenitsyn pointed out, he whose weapon is the lie invariably resorts to violence. Now Ukraine’s destiny is perversely bound up with Russia’s once again. Ukraine can survive for a very long time, even in its currently truncated borders. But Russia cannot have peace and Ukraine, and it can only dream of empire by annexing Crimea and the Donbass. Neither war in its full sense nor peace is likely anytime soon. Since Lavrov’s and Putin’s lies show that they refuse to accept that empire is beyond their reach, they are only hastening what will eventually be the crash of their entire project, and more likely than not, it will be a violent crash.